Amsterdam. The de facto cultural capital of the Netherlands. Characterized by picturesque canals, distinctive old-fashioned townhouses, and heaps of cultural attractions—it is said to have more culture per capita than any other city. It’s no wonder then, that thousands of Europeans, young and old, students and professionals, are relocating here every year. With employment at an all-time high in late 2018—77.7%—the Dutch economy is as attractive as ever for blossoming business professionals. At the heart of the Dutch city, less than a mile south of the historic Noord district—recently named the 12th coolest neighborhood in the world—sits Nyenrode Business University, whose Master in Management program is ranked among the best in the world in the Financial Times’ Masters in Management 2018 ranking. 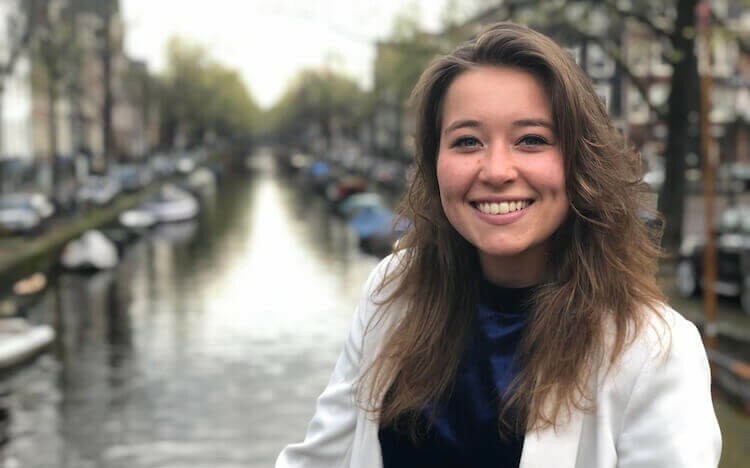 That was all enough to lure Sanne Zegger to Amsterdam and Nyenrode’s Master in Management program, as she was after a wider business education to supplement her knowledge of the hospitality industry, and to launch a new career. “I knew I wanted to move away from hotel management, and found that hospitality is in every company, not just in a hotel,” she says. Why you should study a master’s in management in Amsterdam? Sanne explains that she chose to study a master’s in management over an MBA as she had less than three years’ work experience, and she could also specialize in digital business and innovation—one of the three tracks for master’s in management students at Nyenrode. But the benefits of studying at Nyenrode go far beyond the classroom. In the small community at the school, Sanne has noted how valued she feels as a student, feeling like “more than just a number”. The smaller class size has also given her closer access to faculty, who she says take a genuine interest in the progress of their students. Networking opportunities, moreover, have been far more accessible for Sanne at Nyenrode than she found beforehand. “You learn how to communicate with your network around you, rather than just fellow students,” she says. Part of this is an introduction to companies, in particular through the nine-month consultancy project which each student undertakes as part of their degree. Sanne has just begun her consultancy with ShareNL, a platform which encourages cities and companies to enhance their sharing economy. She adds that this has given her privileged access to the business network in Amsterdam, with whom she is now working on a weekly basis. This ultimately pays off for Nyenrode’s Master in Management students, with 90% of students finding employment in the four months after graduation. As someone with less of a foundation in business, the Master in Management at Nyenrode proved to be the perfect choice for Fernando Marques. Despite hailing from Sao Paolo, Brazil, Fernando was not unfamiliar with Europe, having studied his bachelor’s degree in Switzerland and Germany. Although he had experience working at his father’s pharmaceutical company in Brazil, he felt that a master’s degree would be worthwhile. “It is common for people to have a bachelor’s degree, so a master’s is quite essential to give you a lift in your career,” Fernando underlines. The first four months of the program are designated as a ‘Pre-Master’, providing the foundational knowledge for a student like Fernando, giving him a grounding in subjects like business statistics, organizational development, and foundations of finance. Crucially, however, access to Nyenrode’s business network has proved invaluable to Fernando launching his own business career. He is undertaking his business consultancy project at TomTom, the navigation technology company, focusing on market research. On top of this, the Master in Management took Fernando to China, on a study expedition which offers an insight into Chinese manufacturing plants and the opportunity to understand how to implement sustainable programs. For the start of Fernando’s business career, Amsterdam has provided the perfect launchpad for an international student looking to integrate easily into Europe. “It’s very international, making it very easy to get around just speaking English,” Fernando notes. And settling in Amsterdam seems to be part of Fernando’s long-term plans, as he looks to study an MBA after graduation, and eventually follow his father’s footsteps into pharmaceuticals.